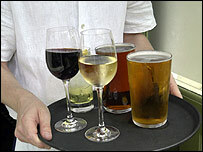 The study highlights figures that suggest a large increase in the amount of alcohol being drunk by 11 to 13-year-olds. Public Health Minister Caroline Flint told the BBC she did not think the proposals would be enforceable. It is currently illegal to give an alcoholic drink to a child under five except under medical supervision in an emergency. The report's figures, published by the Information Centre (IC) last November, showed boys aged 11 to 13 who had drunk the previous week drank an average of 12 units of alcohol in 2006 compared to eight in 2000. The figure for girls increased from just under five units in 2000 to just over eight in 2006. A spokeswoman from the IC, which is a special health authority that provides information to the NHS, said: "It would be too early to say whether this most recent data was a blip or a genuine increase in drinking among this age group." Alcohol Concern chief executive Srabani Sen said: "Our report shows that we are simply not doing enough to protect our children from alcohol. "Binge drinking by children can have serious consequences for brain function, significantly raises the risk of alcohol dependency in later life and diminishes their life chances." Ms Flint said there would be difficulties in enforcing a ban on drinking in the home. "I don't think passing a law to ban alcohol for those under 15 would be enforceable or necessarily effective. "But certainly one of the things that we do need to think about is how we all, as parents with families, do what we can do to have a sensible drinking message within our own homes." She also said the government was serious about tackling alcohol-related harm and that levels of binge drinking were no longer rising. "Recent figures showed there has been a 5% drop between 2001 and 2006, of young people aged between 11 and 15 who had drunk alcohol in the previous week. "The new alcohol strategy to be published this summer will continue to drive reductions in alcohol related offending and harmful behaviour through a combination of education, treatment and tough penalties." Ms Flint's views are supported by a Scottish charity which fears that putting alcohol completely out of bounds could make it more tempting. Alcohol Focus Scotland is in favour of the continental approach of educating children responsibly about drinking and thinks that the ban proposal is a step too far. Alcohol Concern would include meal times at home in the ban on giving alcohol to young people. "One of the things we need to do is get parents on board." He also suggested there was a need to consider new legislation regarding the issue. The charity would like to see a ban on alcohol advertising before the 9pm television watershed and non-18 certificate films in cinemas. The National Curriculum should include alcohol education to teach about the dangers of binge drinking, it added. Alcohol Concern said the drink-drive limit should be lowered from 80mg to 50mg per 100ml of blood. The charity's Glass Half Empty report looked at the government's strategy which was published three years ago. Meanwhile, the BBC's Helen Neil said there were calls for alcohol education to be included in the national curriculum in order to raise awareness about the dangers posed by drinking. She said tighter control on drinks advertising have also been suggested by campaigners. Children and drink: What's legal?